Tetsugaku, the International e-Journal of the Philosophical Association of Japan, calls for papers for the special issue, “Analytic Asian Philosophy” (Vol. 4, 2020). Analytic Asian Philosophy is the emerging filed of philosophy that tries to shed fresh light on Asian philosophy, classical and modern, from perspectives of analytic and other contemporary philosophy, and to create novel philosophical views on the world and ourselves in the age of globalization. It was pioneered by, among others, B. K. Mathilal, an Indian philosopher who attended Quine’s classes when he was educated at Harvard, and much discussed with P. F. Strawson and Dummett when he taught at Oxford. M. Siderits, T. Tillemans, J. Garfield and G. Priest are among present-day leading figures of this field. A number of Asian philosophers of new generation, who were trained in the Anglophone institutions, are following their initiatives. Some of those philosophers have been occasionally applying contemporary logic, classical or non-classical, to make sense Asian thoughts that had appeared to be irrational or even non-sensual. Asian philosophical traditions to be reinterpreted or reconstructed include Hinduism, Buddhism, theravāda or mahayāna, Chinese philosophy such as Confucianism and Daoism, and the Kyoto school of philosophy. This special issue is one of the world’s earliest attempts to feature such innovative topic, expecting the following themes as its main target subjects. 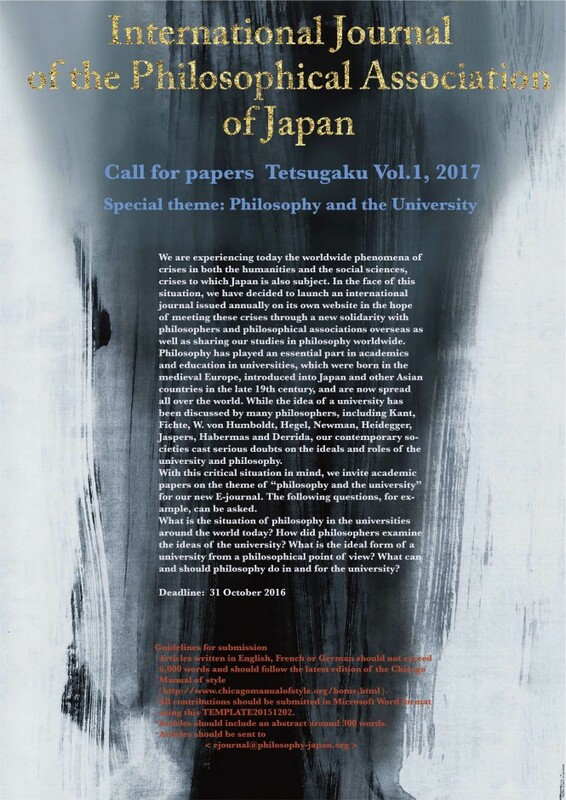 Tetsugaku, the International e-Journal of the Philosophical Association of Japan, calls for papers for the special issue, “Philosophy and translation” (Vol. 2, 2018). The history of philosophy, East and West, is inseparable from questions of translation. The issues of translation range from its literal, conventional sense of interlinguistic conversion, to a much broader, cross-cultural and intracultural endeavour. Translation can also function between academic disciplines. Across this broad range, the scope of translation opens diverse paths in the crossing of borders. Translation can be seen as a window through which to reconsider the task of philosophy today. We can also use different prepositions to mark different aspects of the juncture between philosophy and translation: philosophy of translation, philosophy in translation, philosophy as translation. Philosophy has played an essential part in academics and education in universities, which were born in the medieval Europe, introduced into Japan and other Asian countries in the late 19th century, and are now spread all over the world. While the idea of a university has been discussed by many philosophers, including Kant, Fichte, W. von Humboldt, Hegel, Newman, Heidegger, Jaspers, Habermas and Derrida, our contemporary societies cast serious doubts on the ideals and roles of the university and philosophy. With this critical situation in mind, we invite academic papers on the theme of “philosophy and the university” for our new E-journal. The following questions, for example, can be asked. What is the situation of philosophy in the universities around the world today? How did philosophers examine the ideas of the university? What is the ideal form of a university from a philosophical point of view? What can and should philosophy do in and for the university?